Welcome to part one of the Archer Farms Taste Explosion review! As I mentioned in my last post, I was blinded by packaging at Target and bought a bucketload of Archer Farms foods and mixes. Archer Farms is apparently the store brand of Target, and I’ve never had anything by that brand before. But the packaging is so appealing! So, I’ve decided to take everyone on a taste journey with me as I see whether or not these were actually worth buying. I’m not a big shortbread person. Travis likes it more than I do, but I was drawn to this mix not only by the packaging, but by the tantalizing beckoning of the Vanilla Bean. Love vanilla bean. It makes me happy. So I chucked it into the cart. The mix cost $2.49, and the only ingredients needed were 2 1/2 sticks of butter. Ingredients contain actual food – seriously, here’s the entire ingredient list: Enriched flour, sugar, salt, natural and artificial flavor, and vanilla bean. Nothing weird or scary, except for possibly the artificial flavor. Yay! Instructions were a piece of cake – cream softened butter, slowly add mix, continue beating until dough forms, press into pan, pierce with fork, and bake. Piece o’ cake. Except I screwed up and just dumped the butter and mix in together without creaming the butter first. Oh well. It all worked out in the end. Like I said, I’ve never been crazy about the shortbread. But oh my god, this was the best shortbread I have ever tasted. It’s moist (one of my issues with shortbread is how dry it normally is), the texture is crumbly and elegant, but the flavor is the star – the vanilla is definitely present. It doesn’t overwhelm the cookie, but adds to it, both in taste and aroma. It is a cookie that you take a bite of, and just close your eyes and sigh blissfully. Travis agreed that this was a damn fine cookie. I don’t think he had the same out of body experience that I had, but he was definitely munching on them throughout the day and took some to work with him. I would definitely buy this mix again and recommend it to everyone I know (seriously – next time you’re at Target, buy this mix). My only concern is that now the bar has been raised so high that none of the other Archer Farms products can compare. We’ll see – I’ll let you know next time I make one. 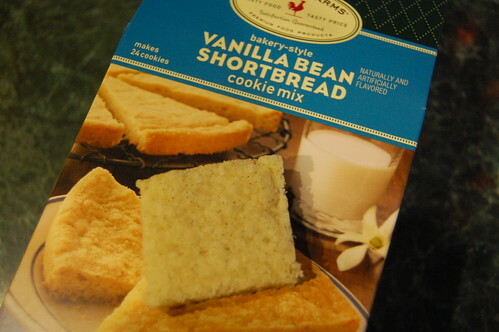 Summary – Archer Farms Vanilla Bean Shortbread Mix – 10 out of 10 points. This is the single best cookie mix I have ever made. So I made those last night, and today Travis and I busted out a double batch of Hershey Kiss cookies, made from scratch. Nothing fancy, I just used the recipe on the back of the Hershey Kiss bag. First off, I unwrapped the Kisses, and discovered a disturbing trend – the Kisses now talk to you! At first, they’re friendly and benign. Then they kind of start getting weird and nostalgic. They then morphed into scary stalker Kisses. “You love me”? Really? Because that’s always a winning line. 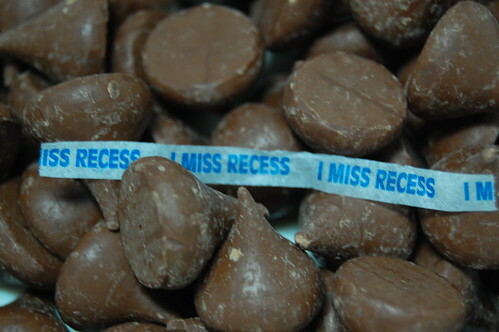 Finally, I discovered the Hershey Kisses of angst. 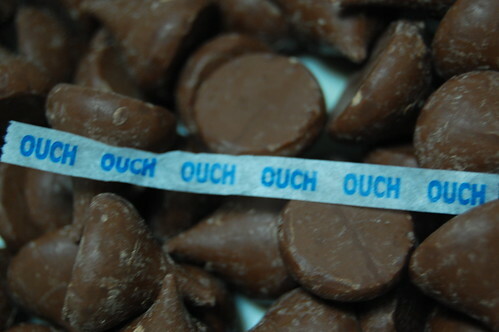 Who wants to eat a chocolate that’s in pain? I don’t understand this at all. Travis thinks it’s a secret message from someone trapped in the Hershey Kiss factory. Anyway, the cookies came out awesome. 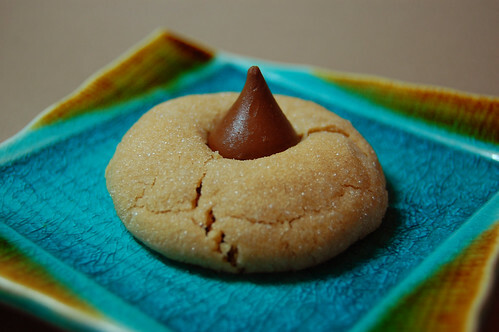 For some reason, the past few times I’ve made these, the cookies have seemed to be too dry and crumbly – I really enjoy a smooshy Hershey Kiss cookie, so I get disappointed when I bake dry and crumbly ones. I’m pretty sure I used the same recipe. Maybe the difference has to do with the humidity today, where it’s not as dry as it normally is in winter. Who knows. They came out perfectly this time, and we have a big cookie jar full of them, so I’m happy. I’ve got some yarn and fiber fun stuff going on, but I’ll post about that stuff tomorrow. For a sneak peak, check out my Flickr photos. Got some awesome roving from Yarn Love Katie, shipped off the Hanukkah Joy yarn to Sarah Lou, and got started on a new weaving project. Not to mention potential Christmas crafting still on my list of things to do. Fun times ahead! Previous PostTarget owns meNext PostWe need emergency Chex Mix, stat! I was thinking about trying that short bread, but TWO sticks of butter? seriously? that is a lot! my favorite archer farms product is the monster trail mix, but all the trail mixes are good! Can I come live at your house???? 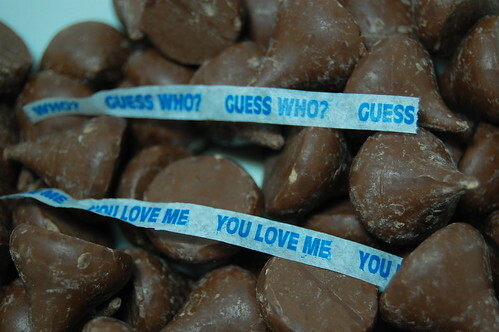 You love me, remember (at least that’s what the Hershey’s kiss is telling me). Those are creepy little notes. 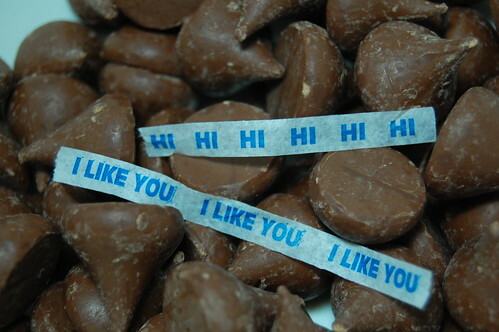 I don’t know if I like the idea of the candies talking to me. Those are picture perfect cookies! Man, you made me hungry for cookies! I love shortbread, I may have to pick some of that up next time I am at Target. 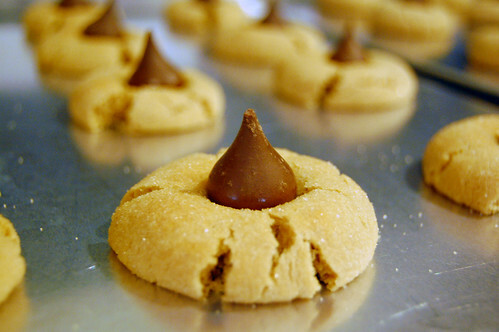 Jacki remember when you were little and we made the Hershey Kiss cookies at home in my pre-diabetic days. You’ll have to bring me a couple for Christmas. I just wanted to say that this post inspired me to go out into the Noreaster to buy a box of Archer Farms shortbread mix. I made the guy I’m seeing do all the mixing work, cause honestly, whats hotter then a man making you cookies, but all that aside these are great. So worth the amount of butter they require. I got two 9″ circular pans out of one box so all my co-workers will benefit from my (or his) baking foray.